This is a really versitile frame as it will take either a 10x8 inch or 7x5 inch photograph, depending on whether you leave the internal mount in the frame or take it out. The aperture is recessed two inches from the front of the frame edge, thereby giving it a really good 3D effect and although the edge is MDF, it has been painted to look like a rough wood grain in a matt, dark grey, so again, is a great look. It hangs both vertically and horizontally and it will stand on its edge. The 7x5 or 10x8 inch photo is fitted into the back of the frame by removing the backboard and the clear glass front gives really good protection to the photo inside. 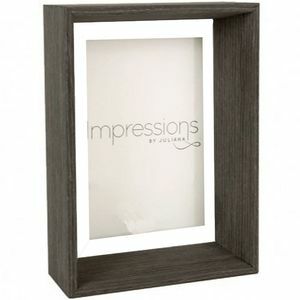 The frame edge is chamfered towards the back, so draws the eye into the image inside.